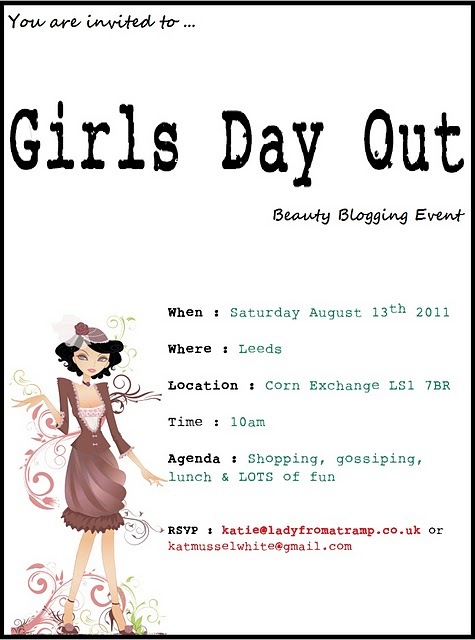 Well Ladies, as many of you might now, it's less than a month to go until Girls Day Out in Leeds, and I have to say that I am getting really excited. My co-organiser, the splendiforous (yes, that is a word in the Dictionary of Kat!!) Katie from LadyfromaTramp has designed a lovely new flyer featuring all the details. If you or anyone you know is interested in taking part, then head over to the Facebook Event Page and RSVP, or drop either Katie or myself a line, and we'll add you on the list. Following a little bit of a discussion over on the event page, we came to the conclusion that we'd book a table at Red Hot World Buffet for lunch, which is why it is really important that people let one of us know that you're coming. 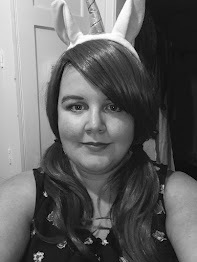 Also, a quick note that if you can't make it for 10am, please let us know, and we'll make arrangements to ensure that you can find us, or we'll send a minion (most likely myself) to meet you. Any more questions that you might have, just leave a comment below and I'll try my best to give you the answers. So disappointed that I am now not going to be able to make this - OH is doing the Jane Tomlinson sponsored 50,000 mile walk or something that day now. Hope you all have a fab time, will look forward to the photos and blog posts after the event! Hello hun! You know that i am there :) Will be at the corn exchange for 10am with Charlotte (http://www.charlottesobsessions2.blogspot.com) & (http://www.girlwiththegoldentouch.blogspot.com)and we are all down for red hut buffet for lunch! Cant wait, really looking forward to it!